Bill Gates once described the internet as the “town square for the global village of tomorrow.” It’s a town square that supports a rich diversity of shops and shopping experiences. Look across markets and you’ll soon discover that not only do people buy things online through different platforms and methods but do so for multiple reasons. To grow their share of e-commerce in a given region or country, marketers must understand the nuances of the particular part of the town square with which they are dealing. CONSTRAINTS Some areas of the virtual town square prove to be very difficult spaces in which to build shops. From Mexico and India to Kenya and Cambodia, there are many markets where the e-commerce landscape lacks infrastructure. So people find it difficult to access online services and are faced with limited payment mechanisms – and in some instances, serious logistical shortcomings. These barriers may limit the size of an e-commerce market to the extent that e-commerce providers can’t function profitably – a problem encountered by the product discovery platform InMobi, so much so that it was forced to centralise operations across different African markets in an attempt to overcome this obstacle. But in many cases, powerful drivers for shopping online – and therefore, powerful opportunities for brands – do exist despite the challenges. Opportunity comes from understanding how and why people in a given market are motivated to purchase online, and facilitating a buying experience that adds value to them. CURRENCIES All shopping involves people trading off the different currencies of time, money and energy. The decision to shop online is no different. But the compromises that are involved in this can vary significantly across markets and categories. In Indonesia for example, the difficulty and expense of delivering goods over a vast archipelago makes it unrealistic for online orders to arrive quickly and cheaply. As a result, low prices and speed of delivery aren’t powerful drivers for buying online but being able to access a greater range of products certainly is. In many African countries, massive unregulated shadow economies mean consumers can often buy from a street vendor (who doesn’t pay taxes on his or her goods) far more cheaply than they can from an online store. In this case, low prices are not the key advantage to buying online but dealing directly with a brand and being more confident of product quality often can be. Thus, local concerns and priorities dictate the true appeal of e-commerce. In the UK, the most compelling driver of buying baby food online is to save money – 47 percent of respondents to the Connected Life study undertaken by Kantar TNS said so. In Hong Kong, where consumers are bombarded with frequent headlines about food-safety scandals, it is the guarantee of product quality that’s most likely to motivate them with 31 percent naming it as their primary reason for buying online. PULL FACTORS The promise of a lower price is often the most important feature of e-commerce in consumers’ eyes – but not always. 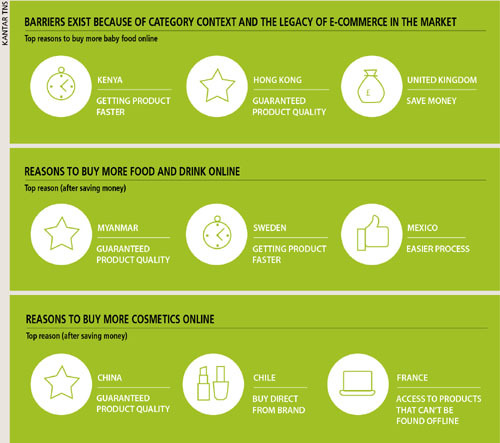 In emerging Asian markets such as Vietnam, Myanmar and Indonesia, product quality is a major motivator for buying food and drink online. Quality is also the most important factor for Peruvians, the Chinese and South Africans when buying cosmetics. It also tips the balance in favour of online shopping for fashion shoppers in Turkey, Nigeria, Kenya and Myanmar. Closely associated with the guarantee of product quality is the appeal of forming a direct relationship with a brand rather than purchasing through intermediaries. This aspect is important to those buying non-alcoholic drinks online in Hong Kong and Indonesia as it comes out ahead of price. In higher consideration categories, the ability to access exotic products that are otherwise unavailable becomes a defining feature of e-commerce propositions. The trade-offs involved in buying online can also vary between urban and rural areas in the same market. Within ‘Tier 1’ cities, a wider range of products can often be obtained quickly by a trip to the local market – especially if those cities have established modern trade infrastructure. Price becomes a more important trigger for buying online and efficient logistics mean that e-commerce providers are better able to deliver on it. INNOVATIONS When equipped with an understanding of the real motives for shopping online, brands are able to innovate with new customer experiences that work around logistical barriers to deliver against those priorities. This often involves integrating online shopping with the rhythms and experiences of traditional trade that still dominate in many markets. In India, Hindustan Unilever partners with small neighbourhood kirana stores to enable shoppers to collect the goods they order from them. This makes perfect sense when you consider that an easy and accessible process is a factor Indians consistently say would persuade them to spend more online. Fusing offline and online experiences in this way can play a key role in overcoming some of the barriers to e-commerce. Nigerian online shopping platform Jumia sends representatives equipped with tablet devices to neighbourhoods to help residents place online orders. It’s an approach that might make little commercial sense in markets with widely established internet access; yet, Jumia recognises the importance of building trust to gain market share once online shopping is ready to expand. Similarly, Indonesian fashion website Zalora receives an extremely high number of customer service phone calls – an average of one for every customer placing an order on its site. This reflects the lack of confidence and familiarity with e-commerce even among Indonesians who are happy to purchase online. Providing such intensive customer service can seriously erode profit margins. By comparison, European fashion sites receive queries on only five percent of orders. But Zalora sees this as a necessary investment for building trust in the market. FIRST MOVERS Focussing on the motives for shopping as well as the barriers that may prevent it is all the more important when those barriers suddenly disappear. In India, a lack of banking and credit card services has limited e-commerce because people must pay cash-on-delivery for goods. Then on 9 November last year, the Indian government outlawed high-denomination 500 and 1,000-rupee notes overnight, making such transactions far more difficult. As a result, digital wallet services increased exponentially with providers reporting fivefold hikes in daily transactions and customer numbers doubling on a daily basis, according to The Times of India. A major constraint for Indians shopping online was the lack of appetite for cashless payment systems until the cash crunch changed it. In such circumstances, when e-commerce hits a sudden potential tipping point, the brands that have already built up trust in online shopping experiences are most likely to benefit. This is why Jumia is prepared to invest in its travelling tablet-toting sales assistants and why Zalora supports its e-commerce services with hardworking call centres. Rather than waiting for a standard global e-commerce experience to emerge, they have displayed an appetite for understanding the triggers and barriers along the path to purchase. And they’re implementing local solutions that resonate with the way people trade-off time, money and energy. This offers e-commerce its broad range of distinct local accents and is the key to growing a brand share of online spending in any market. Vivek V. Krishnan is a Regional Shopper Expert at Kantar TNS – APAC. Ranj Gill is the Global Shopper Director at Kantar TNS.